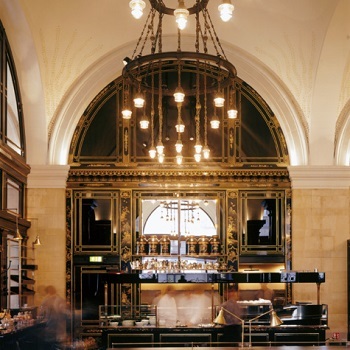 The Wolseley is self styled as a café-restaurant in the Grand European tradition located in St James’ in Piccadilly. However the customers who sit at their tables within the Wolseley and admire the ambition to combine “London heritage and Viennese grandeur” may be surprised to find out they are sitting in an old Wolseley car showroom built in the 1920s. Its lavish interior unfortunately did not attract vast numbers of customers and the Company went bust in 1926. In 1927 Barclay’s bought the site and turned it into a bank. Chris Corbin and Jeremy King secured the site in July 2003 and the building was lavishly restored and renovated before The Wolseley Café – Restaurant finally opened in November 2003. As a Café- Restaurant it is as celebrated for its breakfasts as for its main menu , the Eggs Benedict is a signature dish. Fish menus include Haddock Monte Carlo ,Loch Duart Salmon and Grilled Halibut with Béarnaise. The Wolseley is very popular and attracts a wide range of customers, for Dinner or Lunch booking is recommended but at other times tables should be available. By londonvisitors2014 in London Restaurants on May 23, 2014 .